Home» Tutorials » Dreamweaver » What’s the difference between a website & blog? Many people are confused about the difference between a website, a blog, and a CMS, and choosing which one is right for you can be a surprisingly complex process. We’ll guide you through the issues you need to understand so that you can make the best choice. 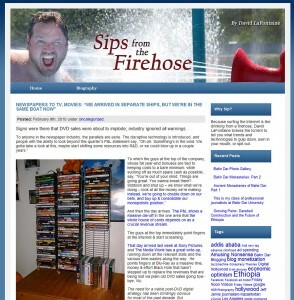 Essentially, a blog (short for web log) is just a special kind of website. Blogs are designed to make it easy for anyone to post text and images to the Internet (even if you don’t know HTML, the programming language that is at the heart of web design). But not all CMS’s are blogs. Just because it’s easy to add a comment or post to a blog, that doesn’t mean it’s easy to customize a blog to look the way you want it to look. If you want a lot of design control and want to vary the design from page to page, you may be much happier with the design options you get when you create a custom website with Dreamweaver. Most blogs ‘look like blogs’ — meaning they have a banner at the top, two or three columns, and a they look almost the same from page to page. Although there are many exceptions (we create custom blogs and websites with WordPress for clients), creating a custom design for a WordPress blog requires advanced programming skills. Blogs tend to look the same from page to page because each page is created from a template. Blogs are easily updated by filling out a simple form — bloggers like to say, “If you can write an email. you can create a blog post.” However, what you gain in automation, you lose in design options. The more consistent you keep the look of each page of a blog, the more efficient it is to set up the blog — it’s a trade off. If you want to create a website with highly custom designs, and you want to vary the designs from page to page, you may want to use Adobe Dreamweaver. 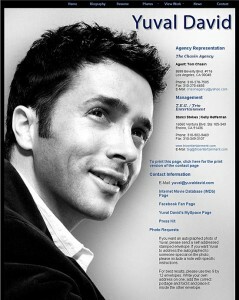 This is the tool that I used to create the page shown here for actor Yuval David. Adobe Dreamweaver is the most popular professional web design program because it offers the most design features. If you love Photoshop, Illustrator, or InDesign, you’ll probably like Adobe Dreamweaver. Adobe’s influence on the interface and integration with other programs in the suite, gives Dreamweaver a similar look, and it’s got the best design features of any web program on the market. If you use every program in the Microsoft Office, or you work in a Microsoft shop, you may like Expression Web (just don’t use FrontPage). If you want to create a site like Yuval’s, or the one I created for photographer Jasper Johal, Dreamweaver makes it easy to create complex design, without having to learn hard-core programming, like PHP (required to customize a blog). Dreamweaver includes a variety of advanced widgets, panels, and other tools you can use to create custom gallery designs, rollover effects, and other interactive features. 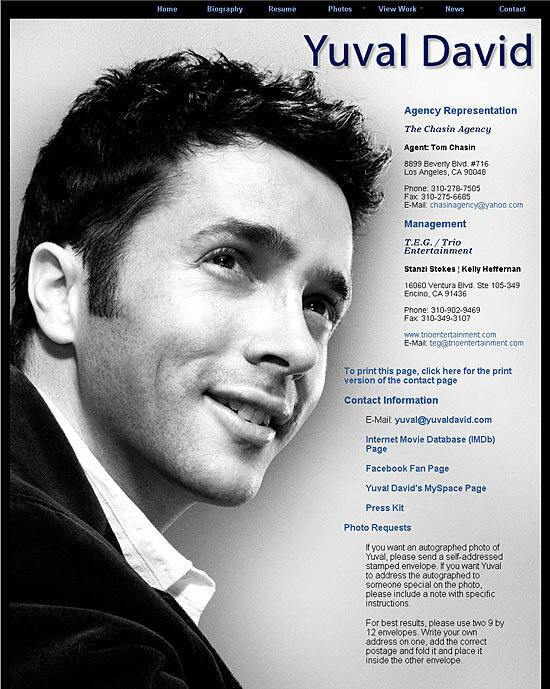 Using Dreamweaver, we could create a variety of designs for Yuval, so his front page (shown on the left) and the contact page could be completely different. Dreamweaver works especially well for relatively small sites. For almost any site that’s less than 50 pages or so in size, Dreamweaver is my first choice, and all the program you need (visit the store to order videos on Dreamweaver). Blogs are especially popular among people who want to share their opinions, expertise, political views, and stories. We often joke that WordPress is so easy to use, even politicians can run their own blogs. Many popular blogs are managed by more than one person, with comments from many readers, creating a kind of ongoing discussion. 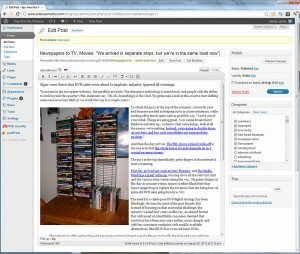 Blogs also include search features and ways to organize information in categories and topics. WordPress is popular because the administrative tools, which you use to update a blog, are relatively easy to learn and don’t require any programming skills. If you can use a word-processing program, like Microsoft Word, you can add a post to a blog. That makes it easy to get started, but like anything there are trade-offs. If you want to create a custom design for your blog, or you want to add complex menus, galleries or other features, the learning curve can get steep fast. You can choose from a gazillion templates (called Themes in WordPress), but if you want to alter those designs, you’ll need to learn PHP, which is far more complex than HTML and CSS (and trust me, those are complicated enough). If you find a theme you’re happy with, or you hire someone (like us) to create a custom blog design, then all you need to do is update the pages using the administrative tools, which really is as easy as writing an email, as you can see from this figure. The administrative features that come standard with WordPress blogs make it easy for anyone to post stories and photos. In WordPress, the administrative page you log into to compose and edit posts is called the Dashboard. To access the Dashboard of a blog, you need a user name and password (that keeps it private), but the only program you need on your computer is a web browser. Only you can know if your greatest talent is as a designer, writer, programmer, photographer, project manager, or all-around techno-wizard, with the skills and dedication to do all the things necessary to build a complex, beautiful site all by yourself. We knew he’d want a lot of design control over every page (he is an artist after all). 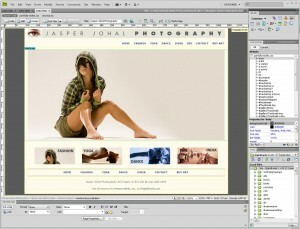 Dreamweaver allows a talented designer like Jasper to customize the look and feel of each page of a site. Because Jasper already uses Photoshop, Illustrator, Premiere, and many other programs in the Adobe Creative Suite, I knew it wouldn’t be much of a stretch for him to learn Dreamweaver. His skills as a designer allow him to conceive and then execute any future tweaks on his own. Increasingly, I use WordPress for client sites because it’s relatively easy for clients to update their own sites when I’m done. Most of my clients are business owners, authors, doctors, actors, scientists — brilliant people one and all — but generally not people who use a lot of complex software. Learning to use Dreamweaver just to make updates to a site they’ve hired me to create for them doesn’t make a lot of sense. We work with a talented team of designers, writers, video editors, and programmers with advanced skills in PHP, Java, and other programming languages. 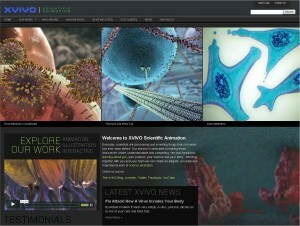 This empowers us to create highly customized websites using WordPress, including sites that don’t “look like blogs” (such as the site we created for XVIVO Scientific Animation, shown on the left). If you are hiring a web design company to create a site for you, or you manage a team of employees that includes programmers and designers, using WordPress or another CMS is almost certainly your best option. But if you’re creating your own website, and you consider yourself a creative person, especially if you’re already a fan of other programs in the Adobe Creative Suite, the by all means, consider learning Dreamweaver. Is WordPress the best blogging tool or CMS? There are many great content management systems on the market. I like WordPress because of its popularity and ease of use, but you may also want to consider more advanced CMS options, such as Joomla! or Drupal. In this article, you’ll find a comparison of CMS and blogging tools. Good Morning, Good Afternoon or maybe Good evening, (Beacuse I am not sure what time you are going to read this Email, Oh ya! and good night too if you are reading it after going to sleep). Hope this finds you in the best of your health and happiness, Its Ehsan (you Global Villager) here all the way form Pakistan, your newest biggest fan of all time. I went through the whole of this page, and it was very very interesting and informative for me because of the reason that I want to make a website, which needs to have a complex design (complex as you mentioned , which varies its style from page to page), so, I want to use both Dreamweaver and WordPress together, because I’ll be managing the content of the website all by myself, and the contect will be text, pix, videos, comments, users registration the things which you can have in a social networking site and also an informative site too, which makes it have a complex design. So, just want to ask you that what would be the simplest and easiest way for me to do that thing. Or if you can provide me with some kinda tutorials regarding this. Hoping for a kindest and quickest reply form you regarding the above mentioned Query. Yes, using Dreamweaver and WordPress together is a great option, and here’s a tip. If you buy the Pro version of the program ServerPress (available for (=$99.95 from http://serverpress.com/) then you can use it to easily edit a WordPress site in Dreamweaver on your local hard drive. It’s a great program, and well worth the cost if you use WordPress and Dreamweaver together.